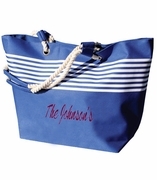 Monogrammed cabana stripe weekender tote bag measures a generous 25"W x 13"H x 7" across the bottom. 12 oz. cotton canvas with zipper closure.